My son, Tyler, was born in 1997. He was our first child, so we didn’t know what to expect – the manual seemed to stop at the point of birth! So we assumed we had a normal, healthy boy who was developing nicely. I remember one parent who brought their son around for a visit when Tyler was still very young. While Tyler was busy putting his shaped blocks into the right hole, the similarly aged guest was busy being a baby. “Is that normal?” asked the friend, of our boy. Dunno, is it? He loved kindergarten. His paintings became bigger and more detailed (one piece of paper was not enough) and he showed a great ability to remember exactly what colour clothes certain characters wore and reproduced them in his drawings from memory. He loved role play too, and was always dressing up as one character or another. By the time he left kindy he was able to read and write – not chapter books or anything like that, but he knew rudimentary stuff. He’d known his alphabet from about aged 2, could write his name and several dozen words, could read basic books. School was going to be fun! Being born in October, Tyler was put into a year 0 class for the first 6 weeks of his school life. Not long after he started I had a look around the classroom at the children’s work – they all had a sheet of paper hanging up about “what my Dad does for a job”. I asked the teacher why Tyler’s story was in her hand writing, and was told it was because Tyler couldn’t write. I assured her that he could. When I asked Tyler about it, he sheepishly told me that if he said he couldn’t do something then the teacher had to sit next to him and help – where as if he could do something then the teacher would be off helping someone else. If he "couldn't" write, the teacher sat by him. What's a new kid going to do? The following school year Tyler started bringing home reading books for his homework. I asked his teachers why he was bringing home books that he’d been capable of reading before he had started at school, and was told that he had tested at that level. A quick chat with him confirmed that yes, he had pulled his punches during the test and yes, he would try his best next time. To humour me, he was retested, and as a result his subsequent reading lessons were done in a class a year above his. But still, he didn’t enjoy school much. We stumbled upon the Gifted Education Centre (then called the George Parkyn Centre) quite by chance. I asked his school teachers if they thought attendance there might be useful for him, but they didn’t see that it would be. After all, he spent most of his time at the back of the class and didn’t participate much, so he was only an average student. We were quite reticent about getting him ‘tested’. After all, he wasn’t ‘gifted’ – he certainly wasn’t writing piano concertos or solving quadratic equations. We let him go to a ‘have-a-go’ session one Saturday morning, where he got to see what One Day School would be like. I deliberately waited away from the classroom, so I wouldn’t be a disruption to him, but every once in a while he would rush out to tell me what he had just done – “I’ve just learnt how to play chess!” – or show me a piece of work or share some information with me. He was buzzing! His school teachers were surprised, to say the least. Meanwhile, daughter Emily arrived on the scene. Emily was a handful as a small child. Always on the move, always with an opinion, always the centre of attention. She would not have slept through the night more than a handful of times before she was 3 years old. I remember her being her usual demanding, cute, extrovert self in a food hall when aged about 1 year old. An old chap who had been watching her from a distance for a while came over. “You’ll have your hands full with that one!” We always joked that depending on what happened to her in life she’d either be the Prime Minister or Dr Evil. Emily was the ruler of kindy. The teachers had an informal sweepstake to see how long it would take after starting at morning kindy (for the older pre-schoolers) before she was in complete control of everyone and everything. The general consensus was that it would take a couple of weeks at least; it took her 15 minutes. Again, when school started, we weren’t sure if she was gifted, or if One Day School would benefit her. Her class teacher placed her in the average sector, and indeed Emily herself thought she was dumb. One day she came home crying because she couldn’t do maths. We sat down with her and went through it, and sure enough she was getting the right answers. But as far as she was concerned she couldn’t do it properly because she wasn’t getting the same answers as her friends! You can tell the days that they have been to One Day School. They have both got so much from One Day School. They’ve been allowed to think as they want, to go as deeply into a subject as they like. They’ve been able to put forward ideas without ridicule, they have been pushed and challenged by children with similar thought processes, laughed at the same ridiculous jokes and situations. They’ve not been restricted by their age or by arbitrary timetables. As a result, their regular school lives have improved no end. They have the confidence to make suggestions, ask questions, lead. They know that it is okay to be a bit different, or to have ideas that other people don’t comprehend or appreciate. And by being out of the classroom once a week they don’t have to listen to yet another repetition of a concept they have already grasped. They’ve also made very strong friendships amongst their One Day Schoolmates – friendships I suspect will last a long time. In 2005 I was invited to join the Board of Trustees for the Gifted Education Centre. As a result I’ve been privy to the stories of many families. Like that of the girl who used to harm herself at school as that was the only way she could get any sense of feeling in the classroom. Like the eight year old who spent his spare time writing a speech about the Cold War for his school’s competition, only to be told by his teacher that the subject was totally inappropriate. Away from One Day School I’ve heard of principals who reckon none of their pupils are gifted ‘because they are brown’. I’ve heard of gifted children with depression, I’ve met gifted children whose schools have advised they be put on drugs to placate them. I’ve met children that I know will end up in prison, when all they need is someone who ‘gets’ them. I’ve met politicians – like Rodney Hide – who totally understand about giftedness and have plenty of stories of their brushes with the gifted. I’ve met others – like Chris Carter – who just don’t get it. My children are lucky. We are not a rich family by any stretch of the imagination, but we can, with a few sacrifices, pay for them to go to One Day School. We know that there are so many families who just can’t afford it. And that just seems so unfair. But we’ve always given our kids the choice – it has always been up to them if they want to attend One Day School, we have never imposed it on them. Tyler decided to stop attending two terms into Intermediate School – One Day School timing meant he couldn’t attend student council or do technology lessons or various other things. A year later, he asked us if he could start back at One Day School again for the final two terms of the year, and we were lucky enough that there was a space available. I asked Tyler what it was like to be back at One Day School. He told me it was great to feel normal again. 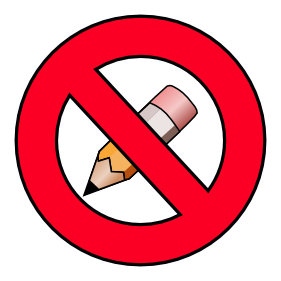 Image credit – the pencil component of the no writing symbol is by Open Clipart contributor dear_theophilus. I teach in gifted education, both online and face-to-face. 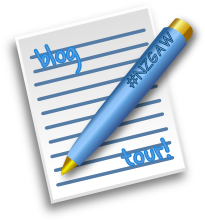 This entry was posted in education, gifted, New Zealand, Uncategorized and tagged #nzgaw, challenge, children's writing, creativity, Gifted Awareness Week, One Day School. Bookmark the permalink. 4 Responses to Gifted – a parent’s perspective. So true in my experience. Thanks for sharing your story, Paul. One Day School is a great resource for families. Thankfully, there is also the Gifted Kids Programme for gifted kids from families who have insufficient resources to make the financial stretch for ODS. We are lucky in NZ to at least have two excellent one-day providers (and I know there are smaller organisations also providing programmes, such as local REAPs). I think there will always be a place for these kinds of programmes as part of the educational puzzle for our gifted kids – not all need them, but for those who do they are essential.